Ladders, Stairs, and Ropes, Oh My! I plan to add ladders, stairs, and ropes (cables) to OpenStreetmap. Do you know the location of these 'hiker-helpers' in the High Peaks? I'm limiting "ladders" to anything with more than 3-4 rungs so the l'il one on Colvin's north side won't make the list nor will the short ones along the Beaver Meadow Trail. Here's the list of qualifying ladders, ropes, and staircases. If you know of any other candidates, please let me know. Whatever is in red has not been mapped yet. The number in parentheses represents the quantity of items. "1/2" means one of the two items has been added to OpenStreetMap. Indian Pass Trail, south of Summit Rock (2) 2/2. Shorey Shortcut (1/1), halfway between Phelps Trail and height of land. Haystack Brook Trail - Need location of 7 ladders. Beaver Meadow Trail, near Beaver Meadow Falls, near junction with Range Trail (2) 1/2 - Need location of the tallest ladder at the upper end of the trail. Giant, Roaring Brook Trail, ~3800 feet elevation (1) - Need confirmation ladder is at 3800'. Mount Marcy Trail, east of Lake Tear (2?) - Need location of the 2 ladders. Noonmark, Henry Stimson Trail (2?) - Need location of the 2 ladders. (?) 1/? - Need quantity and location of new staircases other than the 65-stairs at 3740' elevation. Last edited by Trail Boss; 09-02-2018, 12:14 PM. I seem to recall a ladder a few miles in on the Roaring Brook Trail that was probably at least 8 or so rungs, but I unfortunately don't have a waypoint for it. Edit: According to Telemarkmike's blog, the ladder is at 3800 feet, if that helps to place it. Thanks! I had a vague recollection of something old and worn but wasn't sure about it. perhaps they are not large enough for inclusion, but i seem to recall short ladders near indian head and rooster comb. i feel like there are a couple in indian pass too. Thanks! Yes, I now remember the short ladder that spans a ledge. I can't remember a ladder on Roostercomb but I do recall the trail makes a few switchbacks. Can you refresh my memory? Does anyone have the GPS coordinates for the ladder along the Indian Pass Trail? If so, please send it to me. i want to say the rooster comb one is after the split right (towards the ledge view of keene valley) before the summit. not 100%. checking google doesn't help a whole lot (lots of full GRT reports mentioning the armstrong ladder) but this one page seems to confirm my location as well as offer a picture - though the ladder in the image is bigger than i had remembered. Thanks! That pic definitely rings a bell. The map has the ladder waymarked so many thanks for that! There's that small staircase just below the summit of Cascade. Maybe 8-10 steps or so. I may add that one as a ladder ... even though it is more like a staircase. In OpenStreetMap, ladders appear as icons, like lean-tos, privies, viewpoints, etc. Staircases are depicted as dashed lines (dashes run crosswise, like railroad ties) for the length of the staircase. If the staircase is only a few feet long, it's unlikely to be noticeable on the map unless one magnifies it to the maximum extent. Last edited by Trail Boss; 10-24-2017, 09:10 AM. Haystack brook trail has 8-9 ladders on upper 1/3 of trail. 2-3 are really long ones the longest on par with Armstrong ladder. went that way twice in 2 weeks and tried to remember to count them. between 7 and 9 so I place my bet on 8. there was one tricky cliff section that I remembered a ladder at, that appeared to have been removed. I counted 7 ladders on my trip on this trail in 2013. Also agree that one section looked like it used to have a ladder (or just needed one), but wasn't there. Thank you! I updated the first post indicating the need for the location of 7 ladders on the Haystack Brook Trail. BTW, I enjoyed reading your blog post! Darn, I really can't remember Shoreys that well. Where's the ladder? Is it on the east side of the pass? For "headed up to Lake Tear" I think I listed that one as "Mount Marcy Trail, near Opalescent Gorge". It's almost stair-like, it had lost its two top rungs but they were recently replaced. Is it the same one you're thinking of? Dang, yet another section of trail I haven't seen. You wouldn't happen to have the GPS coordinate for Pinnacle's ladder? Or its approximate location/distance/elevation with respect to the summit? Sheesh, I really can't picture those ladders east of Lake Tear. I'll add them to the list but I'll have to get coords for the map. I wish I knew I wanted this stuff too! I wasn't planning to do mapping work but I'm taking a hiatus from hiking so it seems like a good time to do it. I also didn't think there were more than a dozen major ladders or so but, wow, I was wrong! i don't think i've seen the lake colden dam ladder listed in here yet. that one should be easy to get the gps location. i still feel like there is one or two missing but i might just be thinking of places elsewhere in the adks. IIRC Mt. Colden's south side has 2 sets of long stairs and the north side has one long set in the col between the two peaks (so three total for the mountain). I also seem to remember one of the ladders near the top of the BMF trail being a fairly significant. Also, not to sound like a smart@ss but are you including Whiteface's stairway? Edit: Now that I'm thinking about it, I believe Colden also has a ladder in the col between its two peaks. I haven't been to Colden in over a year so I probably haven't seen many of the additions. I know of one staircase at 3700 feet elevation on the Mount Colden Trail (i.e. south side of Colden). Is there just one up there or two now? 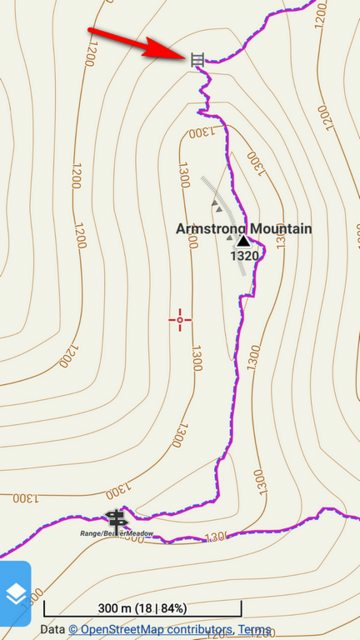 I recently learned there's another one located where the trail turns sharply from east to north, namely around 3350 feet. Would that be the second staircase or the third on the south side? I now believe the same trail has *two* ladders near the top, in close proximity to one another. It's where the trail turns back onto itself at 4450 feet (it heads east a few yards, ascends a ladder up a ledge then a bit more east where it ascends a taller ladder then turns west a few yards then back north). However, I can't picture the ladder between the two peaks (north side of Colden; L. Morgan Porter Trail), only a staircase. I believe the staircase is at ~4600 feet. Where's the ladder? Hmmm. Whiteface. I might include the initial manmade staircase but the balance of the "tourist trail" is mostly natural rock (although with handrails). I'll add it to the list. Now you've really got me thinking about this. I recall there being two ladders and two set of stairs on the south side, and one ladder and one set of stairs in the col between the two peaks. There might have actually been three ladders and three sets of stairs on the south side, but I can't be sure. I'm going to have to re-climb that peak just to satisfy my own curiosity now. It seems like the taller ladders stick in one's mind whereas the shorter ones are ascended so quickly that one forgets about them. For example, there must be at least three or four short ladders through Avy Pass but darned if I can recall the exact number and their location. However, the tallest of the bunch was rebuilt recently and it's arguably more difficult to negotiate than its predecessor. It is in full view of the lake and built against a very large boulder. It used to be almost stair-like but it is decidedly more ladder-like now with each rung made of a 4x4. In addition, most of its rungs are *slanted crosswise*. :-/ Considering the amount of effort and attention that's went into Colden's staircases, this one is unforgettable for its lack of same (and so it made my list of ladders). Geez, I can't picture it. Whereabouts on Noonmark? Along the north side (Henry Stimson Trail) or south side (Felix Adler Trail)? Is it more than, say, 3-4 rungs tall? There is one or perhaps two on the Henry Stimson trail. I assume the ladders are more than 3-4 rungs in length? Does anyone have their GPS coordinates or elevation? Thanks! I've added it to the list and will include it in the map whenever I get either the GPS coords or (minimally) an elevation. Seems like there are two ladders on the Scenic Trail to Sawteeth. Both at least 4 rungs. One as you ascend along the side of a cliff that would be in the lower half and the other near where the trail begins to level out. However, I don't have waypoints. And maybe two rather than one on the level section (near range trail) on the climb from Beaver Meadows Falls. But maybe the second isn't more than four rungs. You are right, sir! I double-checked my photos from last November trip along Scenic and I have photos of two ladders. There's one with 9 rungs below Outlook #4 and another with 13 rungs below Outlook #5. I've got the photos geotagged so I'm good to go for mapping! Thanks for jogging my memory! I've only done that route three times. The first a very long time ago and twice this year the third being only two weekends ago. I believe there is another ladder about 6' tall with more than 3-4 rungs. I'll add it to the list. avalanche lake is popular enough that if you really wanted you could probably find video evidence with a bit of youtube hunting. first youtube video i saw showed (minimum) 3 ladders, though one is fairly small. Thanks! Good idea to review videos of the trail! I went through it twice a few weeks ago ... expecting to discover brand new ladders and boardwalks. However, the recent reconstruction work was focused on the two Hitchup Matildas and one ladderish abomination. All the other ladders were the same ones I've seen many times. Having said that, I'd be hard-pressed to provide a precise count of them but I can picture 4 ladders. There's a boulder with a 6' ladder on its south side and a 4' ladder on its north side. The longer of the two is also seen briefly in the video and may actually be closer to 8-10' in length. From the video I can see it is close to the boardwalk that leads to the abomination. Last edited by Trail Boss; 10-25-2017, 10:06 AM. Call it either a rustic staircase or a sloping ladder, but such a thing exists on the east side of Lake Colden, just south of the junction with the Mount Colden Trail. It ascends to a short boardwalk spanning boulders. I'll add it as a ladder. I wish I would have known to tag all of these things. Now you're making me re-climb them . East side of Colden has two staircases not too far below the cantilevered rock. I'm also fairly certain that there is a ladder on the south side of the Colden shoulder, but no photo. There is a ladder on Shorey's, east of the Phelps trail junction about half way to the height of land. Has anyone mentioned the ladders at the top of the Beaver Meadows Falls trail? I also have some tracks that differ from what I see on OSM. Are you interested in those as well? I mentioned the upper BMF ladders (3 up top, I think?). I believe one of them, which ascends if you're descending from close to the Arm/Goth col is pretty decent sized; more than 3-4 rungs. If you believe one of them exceeds 6' in length, then I'll add it to the list. If anyone has its GPS coords or elevation, please send it to me. I'm familiar with the long staircase in the 2nd photo but not the shorter one in the 1st photo. Where is it with respect to the spot shown in the photo below? If I'm not mistaken, there are two new ladders (replacing old ones) just beyond this spot. It's where the trail heads east, rises along the ladders, then swings west a few yards, then continues north. Is the short staircase near this spot? I'm trying to picture that ladder along the L. Morgan Porter Trail. I believe the staircase is the first thing you encounter when descending Colden's north side. So the ladder must be north of it. Is it on the same slope as the staircase? Or is it on the slope that rises to the false summit? Thanks for the photo of the ladder on Shoreys Shortcut. Odd but I have no recollection of it. Funny how some things make an impression and others don't. I believe the ladders at the top of Beaver Meadow Falls Trail are all fairly short (less than 6'; 3-4 rungs). If you know there's one that's taller than 6', then I'll add it to the list. I'm skipping the shorter ladders to keep this project manageable. Yes, if you have tracks that dispute the existing OSM trails, please send them to me via PM. Please be aware that I use an average of several tracks to draw trails. If one GPS track deviates from the average, I'm unlikely to have it override all others. The only time I'll use a single track is if there's simply nothing else available; something is better than nothing.